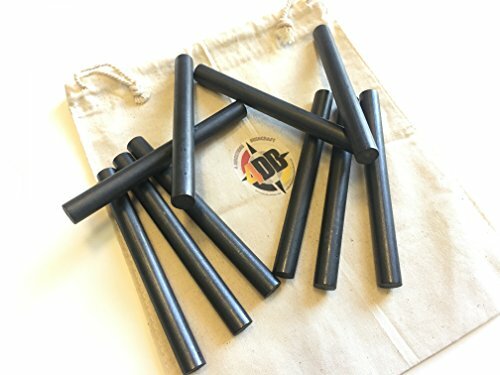 4DB 1/2''x5'' Survival Flint Ferro Ferrocerium Rod Fire Steel Mischmetal Firestarting Rod (Bulk Lot of 10) Blanks DIY Fire Kit bushcraft camping projects by 4 Directions Bushcraft at Kerinci. MPN: 4DB-4. Hurry! Limited time offer. Offer valid only while supplies last. Bulk Lot of Ten 1/2''x5'' blank (no holes drilled and no lanyards) flint ferro ferrocerium rod fire starters DIY Fire Kit bushcraft camping projects. Bulk Lot of Ten 1/2"x5" blank (no holes drilled and no lanyards) flint ferro ferrocerium rod fire starters DIY Fire Kit bushcraft camping projects. • These are the perfect size for any DIY projects you have. • They are a great balance between soft magnesium, cerium and hard iron. • They produce hot dancing sparks and will still last you a lifetime of fire starting. • 4DB logo 100% cotton draw string bag included. Lasts a life time, easy to use, reliable, effective and may save your life in a survival situation.